Clearway - Renaissance: Mayawati Interview - See it First on Clearway! Following the news about Mayawati's Multi-Crore Garland, Clearway, as usual, sent its Reporter to have an Exclusive Interview with the Iron Lady of India, Ms Mayawati. Since any news about Mayawati's Garland means a lot of currency, Clearway wanted to be the first website to publish an Interview with the "Queen of Garlands", the simple woman who fights for India's freedom from corruption and ignorance. The excerpts from the interview are presented here. Reporter: Hello Mayawati ji, first of all, we wish you a very Happy Birthday. Maya: But today is not my Birthday. Why do you ask wrong questions? RP: But they presented you a garland made of money in the stage. So, I thought it was your Birthday. Maya: Arrey, they give me money garlands daily. That was just one more occasion. RP: Oh, sorry about that. 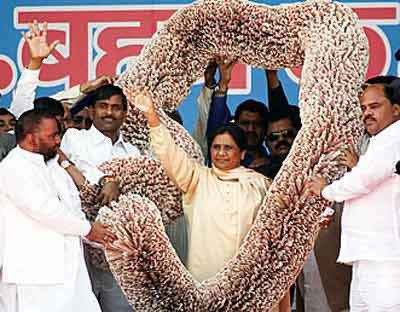 But Mayawati ji, I have heard that you love your garlands so much? Maya: Yes, this is just a way to make our workers work and at the same time, make their work easy. Two garlands in one neck! Maya: You see, I give them targets for number of currency notes. So, they should first collect the amount. Then, whatever is short, they will print. And then, they have to make garland with money. So, this is work for party workers. RP: Oh, ok. But how do you make their work easy? Maya: Normally, workers have to go to the market to buy garland with money. Now, with money garland, they don’t have to waste time buying garland, they can simply make garland with money! RP: Oh, Alright. But, you said your workers also print the money, is that true? Maya: Ah! When did I say that? It was printing mistake . . . er, spelling mistake . . . whatever, slip of the tongue. And how dare you print what I never said? I never said workers print money. Don’t print wrong news about me! RP: I’m sorry, Mayawati ji. I won’t print again . . . I mean, I won’t say that again. How did you collect all that money? Maya: Good question. But a silly one that! See, we have supporters all over India. And our symbol is elephant. We erect elephant statues in all places, and people drop their donations in the elephant's mouth. Mostly, our party followers are villagers and they donate generously. So, we get donations and make garlands. RP: But, during election, you said you would give good life for your voters. Now you say your voters give you money. How is that? Maya: This is just a gift. How can I not accept gifts from villagers who give with so much of love? RP: But what did you give them in return? Maya: They give me love. Love is priceless. How can I give them something in return? It would be insult to love. RP: There are many cases of amassing wealth in your name. Maya: See, you can give only if you have it. Just now you asked me, what I have given them in return for love. How can I give them if I do not have it? That is why I amass wealth, so that I can give them. RP: Where is that money garland now? Maya: That is safe in a safe. I will use it for public welfare. RP: When will you use it for public welfare? Maya: I will use the money for fighting the next elections. When I get elected again, I will use the money for public welfare. RP: But, why don’t you use it now? Maya: I told you I have already used it. I bought a new safe with the money to keep the next money garland. So, both the garlands will be safe. The first one will be the safe, and the second one will be safe. RP: Okay, got it. Why do you like elephants and have it as your symbol? Maya: See, elephants have large mouths. Big mouths are good for elephants and for people. With large mouths, elephants eat whatever is available very fast. And with large mouths, people can keep talking. Big mouths eat and talk. So, I like elephants. RP: Are you the next prime ministerial candidate? Maya: Yes, of course. The elephant has already started walking towards New Delhi. And this time, I have ordered a medium size garland for Sonia ji also. RP: Are you not afraid to take such big money garlands in public? Maya: I am never afraid to serve the society. And if someone objects, I will send them a garland. RP: One last question. That was a very expensive garland, may be a few Crores of rupees. How will you explain to the Income Tax people? Maya: Simple. I earned the money and purchased the garland. Whatever money I had, I invested in the garland, because it was a very expensive garland – you yourself said that now. After I spend so much money in buying the garland, I have no money now. And the garland is safe, because, as I said, the garland is the safe. I bought the garland with the money, and then, I bought the safe with the garland. Now, the safe is safe, but I have no money. Without money, why should I be afraid of income tax people? And I have the next garland ready for Sonia Ji. So, I invest only in garlands. And it is not my money at all. I accept donations, but I donate garlands. Do you understand? RP: Well, I think I have understood one thing. I will definitely vote for elephants in the next elections. Maya: Good, So, why don’t you donate a thousand rupee note for my next garland? You can also write your name in the note so that I will always remember you, and serve you when I become elected again.